Do you like active sports? If you do, then you should know the legendary golf game being a test of technique, skill and experience more than a physical form of a gamer. It is played with a ball on a particularly developed area and sponsored by Rolex, Nike and Adidas being respectful and thus preferred by rich people. This activity is of high prestige and requires heavy spending. But there is an open-to-everyone version of this game – disc golf. It is cheap and can be played on any place almost even in the woods. This game is a real fun and a chance to get some exercises. This game became very popular in USA during the 1990s and continues growing till today. The game is not difficult to master as far as you hold the disc with your hand and there is no need to learn how to hold a driver. To start playing disc golf you should spend about $60 on equipment and that is almost nothing comparing with ball golf. 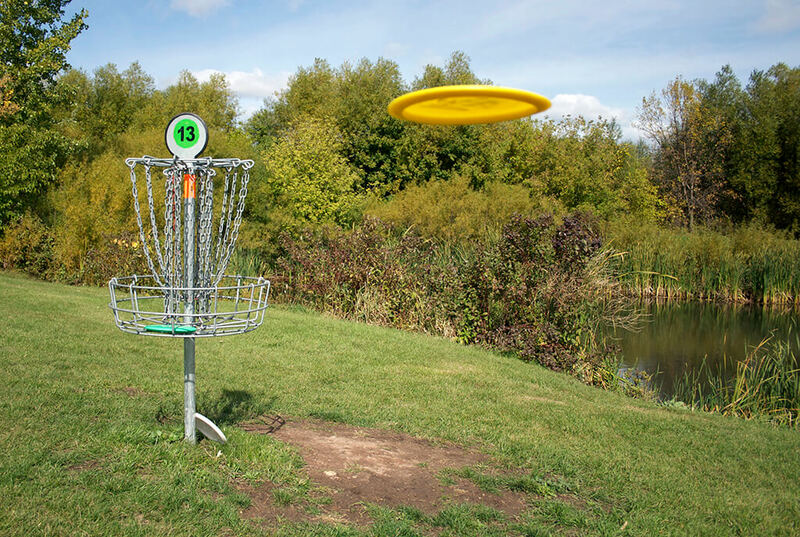 In the disc golf course there are 18 holes, which are shorter than holes in ball golf that is why a round is shorter – approximately two hours with four players. This means that there is more time for pleasure to play several rounds. The players are not expected to book a tee time and pay a green fee. If we compare courses for ball and disk golf, it will be apparent that the latter is much less expensive as far as it does not cost millions of dollars and can be arranged in a city park with the baskets, tee pads and signage. And besides it can be played in the snow. Contact with nature. A course is usually arranged in parks or woods and the players spend their time in fresh air interacting with nature. Unique activity. It is a good opportunity to vary your exercises and achieve the better result with your weight control. This sport is for those who do not like works out but need to be trained. During one round a person can get rid of about 500 calories. Communication with like-minded people. The game is fun and allows sharing your interest with others. Expanding perspectives. People playing this game can boast of new skills and be proud of their achievements in this field. Here you can rely on yourself only. It is not a team play and that builds confidence. Diversification of everyday life. This is a good chance to change the daily environment and have a rest of your work and even family. Relieve the stress. Being simple and active this game allows working out a neck and shoulders taking the stress away of them. Here you can reach a goal and get this positive experience of achievement! Taking into account all above said we can state that disc golf is what men need to stay healthy under any circumstances. When we speak about men health, we mean such a disappointing disorder as erectile dysfunction. And the common causes for this deviation are lack of exercises, obesity, stress, anxiety and depression. Moreover, the things can be even more serious if a man suffers from some diseases of heart or nerves, which lead to impotence. Anyway spending several hours in fresh air, forgetting about difficulties in the office or somewhere else a man improves his strength. If there are some failures, the disc golf is a great possibility to take mind off things and try again later. Remember that facing problems with erection you can buy ED drugs and have a perfect sexual experience. Viagra generico, which is marketed here, is the most popular remedy while Cialis appearing in the world market later is regarded as the most efficient one offering about 36 hours after intake for romantic affairs with a perfect result. In order to save your money you can turn to an online pharmacy and order generic Cialis here at low price but with guarantee of the high quality. It is allowed for men of any age and has a short list of side effects. In order not to reduce the effect, you should refuse fat food and grapefruit just before a pill is taken. There are some other restrictions connected with simultaneous administration of other medicines and health grounds that is why you’d better turn to a doctor and have a professional consultation before starting treatment. If you are fond of Disc Golf, you do care what equipment should be chosen. And the main equipment in this game is a disc. You probably know that there are some numbers on a disc. But do you know what they are for? Well, the numbers explain the property of the tool or to be precise they are flight ratings. You should not be confused with them when buying a new disk. On the contrary, they give you the information that helps to buy the right thing. We are going to offer you a proper explanation of those numbers. But first we should mention that there are several manufacturers, which establish their own system for characterizing of discs. Everybody knows three systems. Now we will consider the first one – the 4 number system or referred to also as the Innova System. It is preferred by some other big producers that is why it is recognized by a lot of people and can be found more often in the market. Being almost a key rating it can be determined by a number on a scale from 1 to 13. Even professional golfers sometimes misunderstand the meaning of this parameter thinking that it defines how fast the disc flies. But that is wrong. Actually you should understand this number as the minimum speed needed for you to throw an implement if you want it to move in the air exactly according to your plans. The higher the number, the higher the speed. Do not be confused if you see number 14, some producers can use it. It is not difficult to understand. You can find glide graded from 1 to 7, but the most common discs have this rating from 4 to 6. The meaning of this number is the amount of float the disc has when flying in the air. It is also known as High Speed Stability and means the amount of curves made by a disc after it is thrown by a hand of a player. You can change this rating applying various throwing techniques. HSS is rated from +1 to -5. This final rating is called also Low Speed Stability and it is very similar to Turn rating, depending on the way a player throws a disc. It shows how the disc will return at the end of its flight. LSS is rated from 0 to 6. When you see a zero, you should understand that the disc will fly in a straight path. Disc golf is an exciting and challenging game. It makes the players fly into passion feeling competition. Still they are expected to be positive, play smart and of course escape throwing the disk towards other people, so there is a kind of responsibility here. The disk golf requires a player to learn the rules keeping them in memory. Mastering the learnt skill sets a man can apply them at work for example. Here you can see as your efforts are rewarded with improved skills and the perfect results. Playing this game a man improves his self-esteem. Being very active disc golf is especially interesting for men who want to exercise in fresh air with fun and without dull works out in a gym. It does not require solid fitness training or some particular skills but still is very mobile and helps to get rid of excess pounds and relax mussels of neck and shoulders releasing tension. Frankly speaking playing disc golf is a perfect opportunity to be physically active without risk of injury. On the contrary, disk golf benefits cardiovascular health, prevents muscle wasting and bone loss decreasing the risk of osteoporosis. Erektiohäiriöiden hoitoon on paljon lääkkeitä. Esimerkiksi Kamagra. On mahdollista ostaa se Suomessa.